Precontact cultures utilized both high and low quality stone for tool making. When they could get it, they appear to have preferred chert, a fine-grained stone composed mainly of silica. This composition makes the stone brittle and able to fracture with a sharp edge. It was preferred by many flintknappers (or stone workers) because the pattern with which the chert fractured was predictable, producing a better formed tool. There are only two known sources of high quality, flakeable chert along the entire Labrador coast. One is in the Cape Mugford region, the other is farther north in the area of Ramah Bay. This second source is found in an extremely limited area, as part of a sedimentary formation that runs from Saglek Bay north through Ramah Bay, ending at Nachvak Fiord. The map shows the location of Ramah Bay, the source of Ramah Chert in Labrador. Cherts from the Ramah Bay formation are visually distinct from other types. Typically, Ramah chert is a semi-translucent light grey stone with parallel black bands of varying thicknesses running throughout. Scattered small black dots are common, as are inclusions of iron, visible as orange rust spots. Ramah chert can also be white or solid black. Archaeologists investigating Newfoundland and Labrador prehistory have identified Ramah chert amongst all of the indigenous cultures of the province. 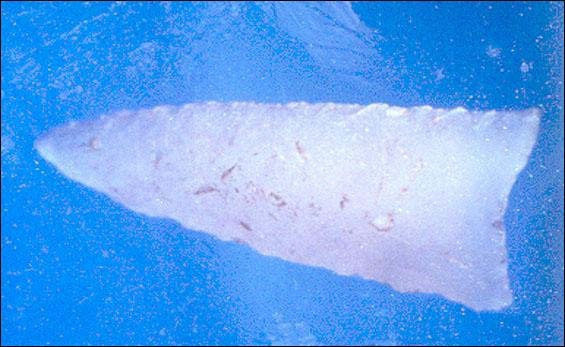 It has been used for at least 7,500 years, as shown by a projectile point found in a Maritime Archaic Indian burial mound at L'Anse Amour, southern Labrador. Dating from ca. 4200 - 3500 BP, these projectiles were found at the Nullick Cove 1 site in Labrador. From The Rooms Provincial Museum Division (IbCp 20:142), St. John's, NL. Reproduced by permission of The Rooms Provincial Museum Division, St. John's, NL. © 2002. The Maritime Archaic Indians who inhabited the province for approximately 4500 years, from 7500 to 3000 BP (before present), were the first to colonize the area of the Ramah deposits and make extensive use of the material. But discovery of artifacts made from this material at great distances from the source of the stone is a revelation. These finds provide evidence of an extensive trade network that existed amongst these coastally-adapted peoples. Sites located as far south as the Maritimes and Maine, and west to Trois-Rivières, Quebec, have all yielded artifacts made from Ramah chert. It has been suggested that these northern bands of Maritime Archaic Indians traded chert in order to get materials that were not otherwise available in their northern environment, such as wood and beaver teeth. This map shows the southern most extent of Ramah chert distribution in eastern North America. Illustration by Duleepa Wijayawardhana, 1999. While Maritime Archaic Indians continued to inhabit the area around Ramah Bay, new groups began to explore the region from the north. Palaeoeskimos, specialized arctic hunters, are first evident in northern Labrador at 4000 BP. While the earliest cultures initially made minimal use of Ramah chert, within several centuries people identified archaeologically as Groswater (circa 2800 - 1900 BP) and Middle Dorset (circa 2000 - 1400 BP) increasingly quarried this material for their tools. Like the Maritime Archaic Indians before them, Middle Dorset groups also developed an elaborate toolkit with Ramah chert as an important raw material. Trade became an important activity, with Ramah chert found in contemporary Dorset sites west of Ungava Bay in northern Quebec, and south to the island of Newfoundland. Ramah chert formed a significant percentage of the lithic remains here, especially for sites on the west and north coasts, where it accounts for as much as 50% of the total excavated lithics. This point was found at the Nullick Cove 1 site in Labrador, and dates from ca. 4200 - 3500 BP. From The Rooms Provincial Museum Division (IbCp 20:35), St. John's, NL. Reproduced by permission of The Rooms Provincial Museum Division, St. John's, NL. © 2002. Intermediate Indians (circa 3500 - 1500 BP), a little known population that is thought to have inhabited the Labrador interior around Hamilton Inlet, as well as coastal areas, generally favoured other types of colourful chert that appear to outcrop in the interior. But in later periods they increasingly used Ramah chert indicating that a trade network was established with the outer coast and farther north. 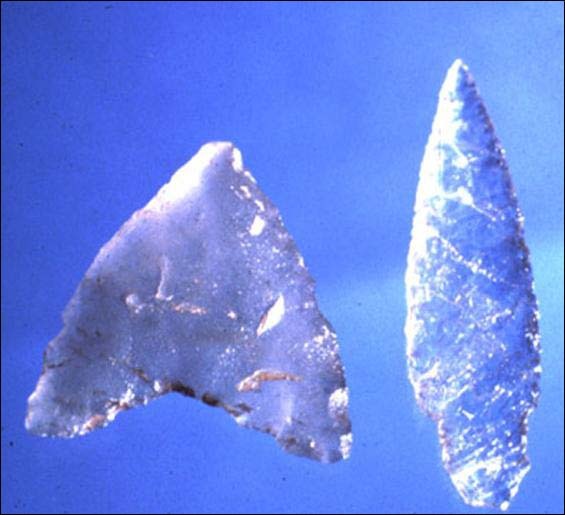 Ramah chert continued to be an important raw material for the people known as Recent Indians (circa 2000/1500 BP to contact). In Labrador, especially along the south-central coast, Ramah chert was the dominant raw material. Sites in Hamilton Inlet again show significant Ramah chert use and it has also been found at Indian House Lake (Quebec). 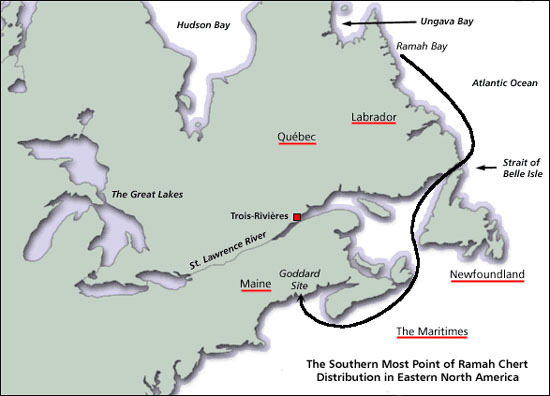 Sites in the Strait of Belle Isle, in contrast, contain minimal amounts, while small amounts of Ramah chert have been found on the west coast of Newfoundland during this period. This point was found at the Port au Choix site in western Newfoundland. It dates from ca. 2800 - 1350 BP. From The Rooms Provincial Museum Division (EeBi-1: T121B), St. John's, NL. Reproduced by permission of The Rooms Provincial Museum Division, St. John's, NL. © 2002. Thule Inuit, precontact ancestors of the Inuit, arrived in northern Labrador circa 700 - 600 BP and they also used a small amount of Ramah chert. Generally though, these people tended to use very few lithics, making tools and weapons from organics such as bone, ivory and baleen. Extensive trade networks such as those seen with Ramah chert present something of a puzzle for those seeking to understand precontact life ways. Why it was traded so extensively and for such a long period poses many questions, and it may have had more than simply utilitarian use. Several factors may be relevant. Chert is workable, but often Ramah chert was used to the exclusion of other more accessible materials of similar quality, such as the cherts from Cape Mugford. Both the Maritime Archaic Indians and Middle Dorset preferred Ramah chert. A second factor involves the prestige linked to an exotic material, one that is more valuable than comparable material. For example, people may be more willing to obtain an object, regardless of the cost, if they gain something socially by its possession. This is certainly a consideration for people who were located great distances from Ramah chert's source. Another explanation, more problematic to understand archaeologically, is the idea of a spiritual or symbolic attachment to the material. Ramah chert's semi-translucent nature, combined with the dark banding and orange iron inclusions could have been seen as a spiritual reflection of nature. 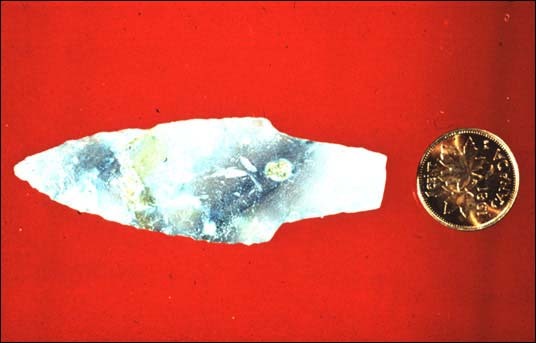 Perhaps the light Ramah chert represented life while darker bands referred to death, and the orange iron inclusions symbolized life-sustaining blood. To produce a tool or weapon with a material combining these spiritual representations could have been seen as an aid when hunting, and one that helped ensure the continuity of life.